It could be debated whether or not Jane should be included as a "Tudor Monarch" but her story is such a fascinating one that it bears telling. 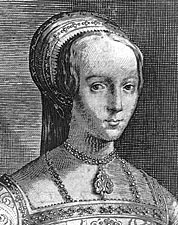 The true tragedy of Jane Grey is that her death was through no fault of her own, but of the unfortunate fact of her heritage and of her religion. She most likely never really wanted to be Queen, but it was not something that was under her control. Her ambitious parents (Frances Brandon and Henry Grey), along with John Dudley, father of her husband, Guilford Dudley, sought to keep a Protestant monarch on the throne if Edward were to die without an heir of his body and to have that monarch under their thumbs. The best way to do that was to make their own children King and Queen. Four days after Edward's death on July 6, 1553, Jane was proclaimed Queen of England. However, Mary, who was the rightful heir to the throne according to Henry VIII's will, was gathering support in Suffolk. She and her followers rode into London nine days later and imprisoned Jane and her supporters. Mary was the next Queen of England. Jane and her husband were held in the Tower of London but were not executed until after a second ill-fated uprising in their name.